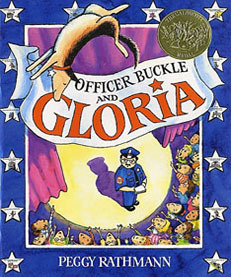 Officer Buckle and Gloria: Officer Buckle loves giving safety assemblies, but he's terribly boring. 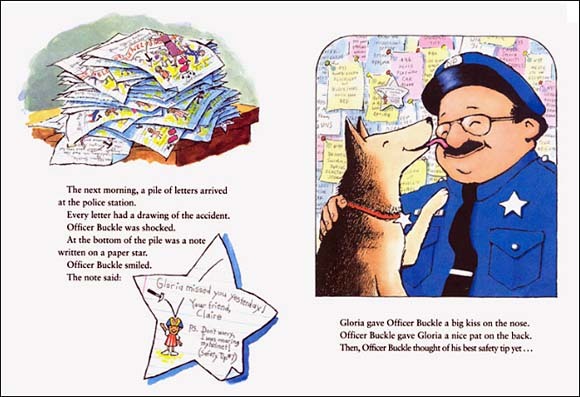 Then one day, Gloria the police dog tags along and acts out the tips behind Officer Buckle's back. The students laugh and cheer, and Officer Buckle thinks he's a hit...until he finds out who's really stealing the show! Full of hilarious cartoons and numerous safety tips, this book is a great read aloud. Rathmann's characters are imbued with so much personality they're irresistible. You don't have to be a dog lover to immediately fall in love with this adorable little pooch. This book teaches safety tips as well as the value of teamwork, but truthfully all that is secondary to how much fun this book is. Your kids will love it! Here are a few interior pages from inside Officer Buckle and Gloria -- to give you an idea of how many words there are on each page and to show the adorable illustration style. To learn more about this book, click the link below. Please note that if you purchase an item from Amazon, they give us a small referral fee. Read this book to your students, then create a classroom bulletin board of safety tips, just as Officer Buckle has created in his office. 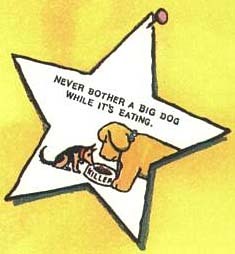 Make it fun by passing out paper with a large star copied on it, have children cut out the stars (so they end up looking like the ones on the front and back end papers), then write and illustrate different safety tips. The subject of personal safety certainly isn't a core curriculum topic, but squeezing it into your teaching schedule is important. All children need guidance in this area, but some children who struggle with poor judgment really need it!